This contemporary writing desk with credenza cabinet is perfect for upscale office interiors. 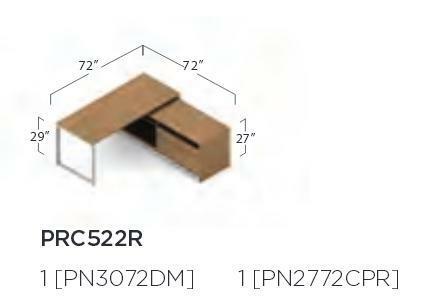 The PRC522R features a 72"W front work surface for operating. Choose from white and winter laminate surface finish options to compliment the silver metal legs. Writing Desk Dimensions: W72 x D30 x H29 IN. Credenza Dimensions: W72 x D24 x H27 IN.